LONDON--(BUSINESS WIRE)--Infiniti Research, a world-renowned market intelligence solutions provider, has announced the completion of their latest article on the importance of market analysis in improving business growth. Behind every successful product or service present in the market today, there is a story of substantial market analysis on competitors and customers. It is the first and the most important step in the development of any marketing plan. Market analysis is the thorough process of data collection to choose whether the product or the service that is going to come will cater to customers’ needs. Effective market analysis can help in getting valuable insights into shifts in the economy, competitors, ongoing market trends, demographics, and the traits of customers’ expenditure. Market analysis is one of the vital components to help business with all the essential information and making wise business decisions. “Market analysis is one of the crucial components to help business with all the required information and making wise business decisions,” says an industry expert from Infiniti. Test before launch: Once your product gets to the final stage, refrain from jumping directly into its marketing. Rather test the product or service before introduction and then market analysis will help you plan the most suitable strategy to market the product. Infiniti Research is a global market intelligence company offering strategic insights to help look beyond market disruptions, study competitive activity, and develop intelligent business strategies. 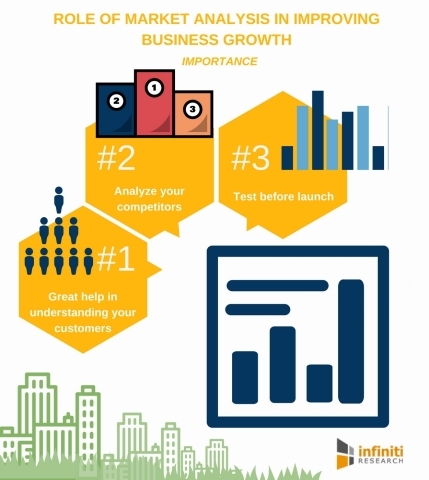 Listed below are the importance of a market analysis to improve business growth. With 15+ years of experience and offices across three continents, Infiniti Research has been instrumental in providing a complete range of competitive intelligence, strategy, and research services for over 550 companies across the globe. Market analysis is the first and the most important step in the development of any marketing plan.